During the US Open, I had conversations with a number of tennis writers about Novak Djoković and coverage of him in anglophone media. For this first installment, I spoke to two Americans who aren’t, strictly speaking, sports “reporters.” While Tignor travels to tournaments much more often than does Phillips, you won’t find either of them asking questions from the front row of press conferences or posting updates on the tennis controversy du jour. Both tend to focus on one match at a time and their articles are generally stylish essays with an emphasis on analysis, not news. Our exchanges were originally published in Serbian by B92. To follow: my discussions with ESPN’s Peter Bodo and The Telegraph’s Simon Briggs. AM: What were your early impressions of Djoković? Tignor: “My first Djoković sighting is very vivid in my mind, because it was a real discovery, with no warning. At the US Open in 2005, a fellow writer and I went out to a side court to see Gael Monfils, an up-and-comer at the time. Then both of us found ourselves watching the guy across the net instead… I remember seeing Djoković hit a series of forehands that looked like Top 5 material. AM: How, to your eyes, has Novak changed since then? AM: Would almost any player rising to the top right after Federer and Nadal face resistance from both fans and media? Tignor: “Yes, I think it is inevitable. Federer and Nadal aren’t just one-of-a-kind tennis players, they’re one-of-a-kind sportsmen. Federer is the most popular player since Bjorn Borg retired 35 years ago, and Nadal has brought an electricity to the sport that didn’t exist before him. Just as important, they became linked in the public eye, first through the 2008 Wimbledon final, and then the 2009 Australian Open final. 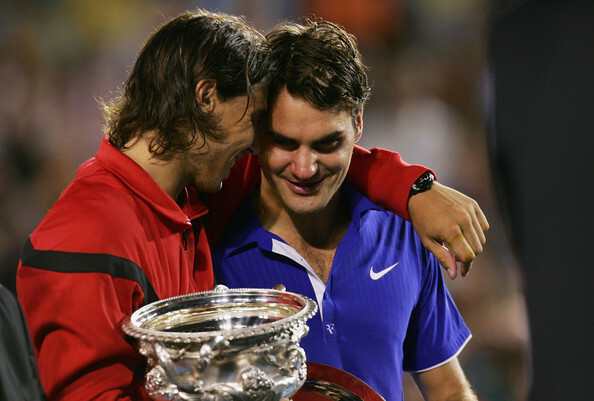 The most famous image of them isn’t of a handshake at the net; it’s the shot of Nadal with his arm over Federer’s shoulder during the trophy ceremony in Melbourne in ‘09. Between them, they also embody so many opposing traits—elegance vs. passion, effortlessness vs. effort-fulness, lordliness vs. stoicism—that it’s hard to know how any other player could find something to represent to fans. They’re the Beatles of the Golden Era, the originals. The tennis writer Joel Drucker wrote something similar about the ‘70s generation. Borg was the Beatles and McEnroe was the Stones; that made Ivan Lendl, the man who vanquished them, Led Zeppelin—brutal, awe-inspiring at times, and hard to love. Djoković is nothing like Lendl in many ways: he doesn’t rule by intimidation, he doesn’t play a brutal style of tennis, and he does go out of his way to connect with fans and entertain them. But he’s portrayed at times in a somewhat similar light—he’s ‘efficient’ instead of ‘elegant,’ ‘clinical’ rather than ‘artistic.’ It’s like he’s taken the fun out of the sport. It’s interesting that Djoković and Lendl are two of the only Eastern European men to reach No. 1. I do think it’s a barrier for U.S. fans. AM: How much does Novak’s being from Serbia impact the Western response to him? Tignor: “I do think there’s a barrier with Eastern Europeans among US tennis fans, but I think Djoković has made strides in crossing it. In my mind, being No. 1 in an international sport kind of raises him above other divisions. AM: Has English-language coverage of Djoković shifted over the years? AM: How has your view of Novak changed since he became the top men’s player in 2011? AM: What do you enjoy or find challenging in writing about Novak? Phillips: “I love writing about Djoković because he’s both one of the most complicated and one of the most talented figures in sports—he’s an extraordinary character, which is exactly what I’m drawn to as a writer. Players who offer easy answers are boring! Tignor: “As a player, I find Djoković’s ability to overcome his own anxieties and frustrations interesting. Unlike Federer and Nadal, he can pull the ripcord mentally when things aren’t going his way. But he’s one of the few players who can then gather himself, settle down, and win anyway (Serena is another). He’s as elastic mentally as he is physically, and that’s not something that was always true. I see a lot of my own on-court anxieties in him, so I feel like I have an idea of how hard it is to do what he does. For a guy who is supposed to be a machine, he’s very human. His screams and fist-pumps may not make him beloved by tennis fans, but I like that he’s himself out there. He wants to be loved, yes, but he can’t help acting the way he acts even if it doesn’t get him that love. Off court, I’ve found his maturation process interesting, especially his ability to be such a professional and carry a lot of responsibility on his back. I also like his sense of humor—it’s broad, rather than cutting. And it’s great that tennis has a No. 1 male player who can dance. AM: Any lasting impressions of Novak from the US Open? Tignor: “The thing that struck me about him in the Open final is how bouncy and quick and spry he was. I’ve never seen Federer look slow, but Djoković came close to making him look that way. He’s really in his prime physically. This weekend in Bangalore, India will host Serbia in an intriguing Davis Cup World Group play-off. Under different circumstances, 2013 finalists Serbia would be hands-down favorites for staying in the elite sixteen-nation group at the top of men’s tennis. But a Serbian side without three of its top players is vulnerable, as seen this past February when the “B” team—composed of Ilija Bozoljac, Filip Krajinović, Dušan Lajović, and Nenad Zimonjić—lost in Novi Sad. Serbia’s second city also happens to be where these two nations first met to contest a Davis Cup tie, a 4-1 win for the Serbs in 2011. When we talked, the final rosters for both teams were uncertain. Bopanna thought he’d be paired with Saketh Myneni, with whom he’d played—and won—doubles rubbers during India’s previous two ties, and the status of the ATP #1 was up in the air. While the rest of the Serbian team was preparing to compete without their singles star, Novak Djoković spoke about both what it means to him to participate in Davis Cup and the decision he was weighing: “Of course playing for the country is something that awakens a real passion in me and a sense of. . . belonging and really positive emotion and drive. But [on] the other hand, I also have a very important stage of my life. I’m about to become a father, so that’s something that is a priority now.” Given the “wait and see” situation, I started by asking Bopanna an obvious question. AM: You said in an interview for the Davis Cup website that you think it’d be good for tennis if Novak comes to India, regardless of the outcome. But in the interest of your team winning, wouldn’t it be better if he didn’t come? RB: You can’t think like that. At the end of the day, he’s been such a great player for his country and won the Davis Cup title with them. Not only that: if you look at it that way, we wouldn’t want any of the top players competing. Davis Cup is such a format that the rankings never matter—I mean, on one given day there can be many upsets. If you saw the last one, Wawrinka was playing Golubev in Switzerland and that was a big upset. So, I think it’d be great for Indian tennis—not only if Novak’s playing, but even if he’s just there as part of the team. Tennis needs encouragement in our country and having a such a great player like him come and participate in an event like this would be wonderful, no matter what. Of course, it’ll be much tougher, no doubt: their team goes up from 10 to 20 with Novak on it. But we have to be ready for the best team to come to India and play. The thing is that before Thursday, they can still change the nominations. AM: It’ll partly depend on what happens here, of course. RB: Exactly. And Novak isn’t thinking of Davis Cup right now, because this is such a big event. AM: There’s the US Open on this end and his baby’s due-date on the other. RB: Yeah, he has a lot of things going on. Since then, Leander Paes was called in to play his fifty-first tie for India and Djoković, after a disappointing semifinal loss to Kei Nishikori in New York, opted to skip the play-off to recuperate for the final stretch of the season and spend time with his expectant wife, Jelena. Luckily, Bopanna and I discussed more than how the two teams match up. The Garden City was named for its numerous green spaces, including Cubbon Park (where this tie will take place) and the Lal Bagh Botanical Gardens. AM: Unfortunately, I don’t think I’ll be able to attend the tie, though I’d love to see India. But I’m still curious: what would you tell Serbs visiting Bangalore (or Bengaluru, as the locals call it) for the first time? RB: I live in the city! The first thing is that language is not a problem, because everyone speaks English; so, that’s a big bonus when you’re going to a new place. I know a lot of people do speak English in Serbia, as I’ve been there. Of course, there are a lot of great restaurants around the city, many different cuisines to sample. Bengaluru is known for its breweries as well, so people who like to drink beer will enjoy that. Though it’s called the Garden City of India, do expect a lot of people on the road, a lot of traffic and honking. That’s normal—it doesn’t matter which city in India you go to. We are used to it, of course, living there; but if you come from a country that doesn’t have all that it can be a bit overwhelming. There are various different categories of hotels and the hospitality in India is always very good—the service is good, so that’s a good thing to expect. People in Bengaluru love tennis, so I think there will be a great crowd, too, to come watch the tie. There are a number of connections between members of the Indian and Serbian squads. Most notably, Nenad Zimonjić has partnered Leander Paes and Mahesh Bhupathi, collecting trophies with both men. Two other Serbs, Janko Tipsarević and Bozoljac, have also had success with Indian partners, winning titles with Paes and Devvarman, respectively. While Tipsy kicked off both the 2012 and ‘13 seasons with quality runs in Chennai, this year was Bozo’s turn for a hot streak in India: he made the semifinals in New Delhi and won the Kolkata Challenger. Not least, the two nations have this in common: they’ve both produced remarkable results in tennis despite not having the world-class infrastructure of some of their Davis Cup rivals. AM: Obviously, it’s a big deal to have Davis Cup at home, and I know you have the ATP 250 event in Chennai, as well as the series of Challenger tournaments in February. You have had so many top players in the past couple of decades, and a long tennis tradition as well, rooted in the British influence. How would you assess the current state of Indian tennis? RB: I think there’s still a long, long way to go because our system is not really good. So, that is slowly picking up. [To give an example,] I have a physio from South Africa, Shayamal, traveling with me for a while and he’s now opened his own clinic in Mumbai, trying to help and get physios involved in tennis. Especially for an athlete, after training, you need a physio. So, even the awareness of that—plus fitness, along with coaching, and building a few more academies—makes for more progressive tennis. It’s going to take a while, I think, to really come up. There’s also good corporations coming out and helping a lot of these academies and teams, which raises awareness and gives everyone hope. You know, in India it’s still the fact that people think, “Ok, so you’re playing tennis, but what else are you doing?” In India, the [professional] priorities are such that everybody needs to be either a doctor or an engineer—studying is such a big thing. A lot of people don’t realize that tennis could also be a living. And they don’t realize that it’s a full-time, committed career. . . It’s not a hobby. Also, we have cricket in India—and it’s grown so much in recent years. Now, there are corporations trying to invest in other sports as well and trying to get recognition for them. So, tennis is still very much at the grass-roots level and needs a lot more building. Luckily, we have many more athletes coming up. . . . The fans are looking for new, different sports as well, which is nice. AM: Speaking of other sports: in the US, there’s been some excitement about an Indian basketball player who’s going to be in the NBA, playing for the Sacramento Kings. Have you heard of him? RB: That’s right, Sim Bhullar—I know because actually he’s the nephew of one of my friends. He was telling me when we were into Toronto [for the Rogers Cup] and they actually came to the tennis courts. My trainer took a picture with them and he’s about 5’8” and these guys are 7’5”! AM: India, given its size, has a huge pool of potential talent that hasn’t necessarily been tapped. Will his being in the NBA make a big difference for basketball in India, like Yao Ming did in China? RB: Definitely. I think it’s great. Hopefully, we have more of those 7-foot athletes—that’s not there in India so much. Even when I go back, at 6’3”, I’m considered above average, which I’m not when I’m traveling on the tennis tour! In tennis, I think 6’2” is the average. Especially for the NBA, you need the height. AM: Among people in the former Yugoslavia—and not only tennis players—there’s certainly interest in forging ties with the East as well as the West. For instance, even before his Uniqlo sponsorship, Novak was quite attuned to the Asian market for tennis. Do you think the IPTL (promoted by former partner Bhupathi) is also going to help the growth of tennis in India and other parts of Asia? RB: I think it’s going to be really good for Asia to have all these top athletes coming and playing night matches. And for us, as players, it’ll also be fun to be a part of it and playing on these different teams. In June, Bhupathi hosted a London reception for players committed to the new International Premier Tennis League. Three of Serbia’s biggest names have already signed on to play in the IPTL later this year: Djoković and Zimonjić (along with Croatian legend Goran Ivanišević) were selected by the UAE team, while Ana Ivanović is on the India team along with Bopanna, Sania Mirza, and Rafa Nadal. The league runs for two weeks, starting in late November. Postscript: The day after this interview was published, the ITF announced that Rohan Bopanna will be one of the players honored with the Davis Cup Commitment Award this weekend.